As with recent years, 2009 got off to a good start with good showings of Calocybe gambosa, the St George’s Mushroom although very little else was in evidence. The plethora of Laetiporus sulphureus, Chicken of The Woods,with which we were so gratefully laden in May 2008 was not in evidence during early to mid May. June was to be the month for this handsome and delectable fungus, although not in the prefusion of 2008, a few scattered fruitings over a short period was all we were afforded. In April I began my second survey for the Royal parks, this time at Bushy Park nr Kingston. During the April/May visits we recorded, Entoloma clypeatum, alongside Hawthorn hedgrows and Agrocybe molesta a species that I don’t often happen across. During May beneath a Cypress tree, Agaricus gennadii was recorded, a rare species of the genus. Up at Kenwood, The Northern heights of Hampstead Heath, things were a little better, good early showing of St Georges, Psathyrella spadiceogrisea, Agrocybe pediades, Panaeolina, Laetiporus, and as we headed into June, Russula vesca, Russula grisea, Amanita rubescens, Amanita excelsa, Boletus declivitatum among others and to cap it all off the hugest Giant Puffball I have had the pleasure to hold in my arms. My feeling is that the harsh winter, combined with the hot weeks during late June and early July, may well lead to a good old traditional autumn season. This assumes that we do have some decent amounts of rainfall, which we have had a fair amount of already. The following weeks during June, July and into the beginning of August, things went from strength to strength, particularly Russula and various Boletes. Species new to Middlesex such as Russula carminipes and seldom recorded species such as Russula romellii and Boletus appendiculatus came and went during these months, as well a wonderful display of Russula rosea, new to the Heath,that didn’t seem to want to stop fruiting. Russula graveolens and its many varieties were abundant in particular areas with Oak as were Russula grisea and R. parazurea. Russula virescens, Russula violeipes, Russula heterophylla, Russula cyanoxantha, Russula sororia, Russula amoenolens, Russula farinipes, Russula atropupurea, Russula risigallina, Russula ochroleuca and the 2nd and 3rd only records of Russula pseudo-affinis in the UK were all recorded during the summer months. There was also a prolonged and unprecedented fruiting of Leccinum crocopidium, with some huge specimens. Curiously there was a lot of activity around an Oak tree that had been terra-vented back in March and then surrounded by a dead hedge, many of the species mentioned were under or close to the dead hedge surrounding this tree. As ever, this foray gave us some exciting finds, kicking off with the Death Cap, Amanita phalloides found in grass, near Oak in the car park, very close to a golden smatter of Chanterelle, Cantharellus cibarius. As only the second foray into the 2009 season this was most welcome as things had turned rather dry around London. My only second record of Gyroporus cyanescens came on this foray, and as my first was from here also, it was good to note that this recent record was from a different spot. There were also plenty of Russula species such as R. velenovskyi, Russula betularem, Russula ochroleuca, Russula claroflava the hugest R. nigricans also Leccinum scabrum, S. variicolor and R. halopes were among the polytrichum moss in the Birch copses and Lactarius helvus in such numbers that its spicy aroma filled the air around it. Sixty species were recorded in total. Things didn’t quite pan out as I thought they might back at the end of August, as September and early October turned out to be very dry. But one must never despair with fungi as there is always something to see or discover whatever the weather. September was the month for Hen of the Woods-Grifola frondosa. This species continued well into October. However it wasn’t alone, Honey Fungus was fruiting everywhere in large clumps, Armillaria mellea, Armillaria gallica and Armillaria tabescens – The Ringless Honey, all blossomed as never before. During August I began a second survey for the Royal Parks this time at Kensington Gardens. The first visit was very fortuitous as we had just had a good amount of rain and temperatures were quite high. Many different species took advantage of these conditions, Russula grisea, and Russula graveolens were abundant with the Oak trees in the park and much rarer species such Rubinoboletus rubinus were recorded also. Unfortunately this was the last time we would see so many mycorrhizal species in the park but we were not disappointed by some of the species found among the shrub and flower beds on the rich soil. Many Agaricus species such as A. osecanus, A. arvensis, A. silvaticus, and A. bisporus were present during practically every visit as were Calvatia gigantea the Giant Puffball and Chlorophyllum rhacodes and C. brunneum – Wood/Shaggy Parasol. 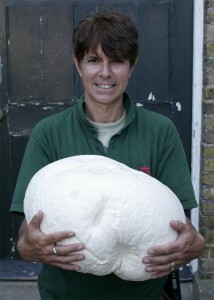 There were some excellent records such as Melanoleuca brevipes, the very rare Lepiota cingulum and Leucoagaricus serenus. Kensington Gardens turned out to be a very interesting and rewarding site for fungi. The last day of the survey on December 16th was spent in freezing temperatures and driving snow, those fungi that had fruited prior to the drop in temperature were now like model mushrooms, frozen solid where they had fruited. Frost tolerant species such as Lepista saeva, Lepista nuda and Hygrocybe virginea were present and are what you would expect at this time of year. We hit a bit of dry patch during most of September into early October and the fungi retreated. 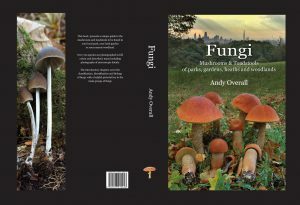 However as soon as the rain arrived and with the temperatures still relatively high, the fungi began to take hold. The forays were going very well and beginners workshop on Oct 10th saw some lovely collections of Ceps from Hampstead Heath. My flat began to resemble the woodland itself with specimens from the surveys & forays taking up two fridges and large spaces on my kitchen surfaces, all sporing and waiting to go under the microscope for identification. I was up to my ears in mushrooms and toadstools and at times couldn’t see the shrooms through the trees. All sorts of fungi were still fruiting right through November and well into December, before the big freeze hit. Reports of Boletus edulis only really getting going well into November was very unusual. My last foray at Epping Forest on 15th Nov saw a lot of Bay Boletes – Xerocomus badius and a good showing of the rare Amanita submembranacea. I thought it was an excellent season for all types of fungi, mycorrhizal, Saprobic and Parasitic alike. Grifola frondosa the Hen of the Woods came during the dry spell in September when there wasn’t too much else around. Russula species came early during the wet summer and then again in late autumn, Boletus species were sporadic throughout reaching a peak in late autumn. Cortinarius, Inocybe, Agaricus, Pholiota, Lepiota, Macrolepiota, Lactarius, Hebeloma, Mycena, Laccaria Clitocybe, Lepista and more were all in evidence with a variety of different species.